Wow c'est impressionnant tes pantalons ! Bravo pour ton travail. Moi j'ai remarqué que je suis un peu meilleures à la course. I do step aerobics three days a week and Jazzercise 3 days a week. I also work in the yard and garden. WOW! Looking good girl!!!!! What a difference in your pants! WoW! Look at that difference! Fantastic! you're doin great darlin, i myself am apparently just mixed-up! lolol gonna do better though! 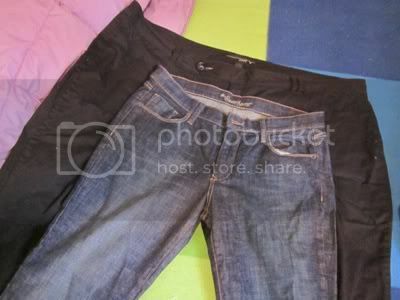 Love that pants comparison pic - AWESOME! I have a picture just like that! Only mine has a pair of size 24 pants in the back, but I've got the same Old Navy 12's! Congrats! Dang that photo is amazing! Congrats! I'm taking swim lessons so that I can add that to my workouts this summer! I'm really excited about it!